On Sunday, hundreds of fisherman, women and children ventured to Mammette Lake for a fun-filled day of ice fishing. This was the 9th Annual Ice Fishing Derby organized by the Nicola Valley Fish & Game Club (NVFGC). The weather was perfect with a blue sky and brilliant sunshine and by 10 a.m/ the lake was crowded with over 260 people. It was particularly encouraging to see so many children and families in attendance – proving the point that fishing truly is a sport to be enjoyed by the whole family. Over the years the NVFGC ice fishing derby has become a traditional event with a solid reputation for good organization and generous money and goods prizes. The event draws participants from Kamloops to Chilliwack and every community in between. Over the course of the day a slow but steady number of fish arrived at the scale, and by 2:30 p.m., the official end of the derby, over 30 trout and coarse fish were weighed in. The numerous and varied derby prizes were generously provided by Merritt business owners. During the event, two Conservation Officers were present handing out goodies to all the children. They also provided the concession tent for the event. Merritt Search and Rescue Team generously provided a second tent, but due to the exceptionally nice weather it wasn’t set up as additional shelter. The club provided free coffee, hot chocolate and donuts, and for the modest price of $1 hot dogs were available too. An event of this proportion couldn’t go smoothly without all the fine people in the background volunteering their time and effort in organizing it. The many volunteers from the NVFGC made sure that this year’s ice fishing derby would be remembered by everybody who attended. 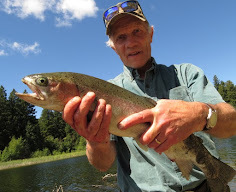 Mammette Lake is not known as a trophy fishing lake; but still, the fish that were weighed in were respectable. The first prize in the children’s trout class weighed in at 2 and 3/8 lbs and second prize went to a young fisher with a beautiful 2 and 1/4 lbs rainbow trout. The ladies didn’t do too shabby either with the first prize going to a woman with a 3 and 1/8 lbs rainbow that was followed by a 2 and 1/16 lbs trout. The men didn’t hold back either with first trout prize weighing in at 3 and 11/16 lbs and second a close 3 and 3/8 lbs. In the coarse fish class, a monster sucker weighing a solid 4 and ¾ lbs won first place and second place came close with 4 and 5/8 lbs. Other prizes included a hidden weight class, a 50/50 draw and many door prizes. As the chairman of the Ice Fishing Derby I would like to thank personally, and on behalf of the Nicola Valley Fish & Game Club, the many volunteers behind the scenes, to numerous to mention individually here, for their time and effort they spent to make this event possible and a memorable experience for everybody I also would like to that the local business for their generous donations of prizes and money. Without your continued support this event would not be possible on such a large scale. Wow! That's all I can say, when I read this blog and look at the photos. Being a native from the Florida Keys and now living in Tampa, Florida the thought of ice fishing just blows my mind. It must be pretty neat to be into an ice fishing derby, I'm not gonna lie I'm rather jealous that I don't have the oppurtunity to take part in such as event. Thank you for the visit and the comment. We up here in the cold north feel the same “jealousy” when we watch fishing show from Florida, everybody sun tanned sitting in a boat with short and T-shirt while we here dress up like Eskimos and still shiver by minus 40. By the way you have a good blog going there and I look forward to read more. Keep the good work up.